A lot of tech folks are somewhat miffed at the lack of big announcements at this year's CES edition. Granted, the TVs are finally moving away from the 3D flop and into something more tangible like Ultra HD resolutions and curved OLED panels, and in our neck of the woods we had a waterproof Full HD screen Xperia Z phone from Sony, but there was nothing earth-shaking, they say. We tech journalists are a spoiled bunch, though, as we get to play with the latest and greatest on a critical eye, and often whine about quibbles most wouldn't even notice. There were actually many underground trends to discover at CES 2013, and one of them was Android creeping onto every gadget imaginable, and ready to communicate with its original edition on your smartphone. We'll just list you three examples, so you can see for yourself where this is going - we had Android-controlled fridges on display last year, but this CES edition the manufacturers really took it to the next level, and we can only imagine what we'll be able to do with our Androids next year. Dacor, which refers to itself as a "market leader in the design, manufacture and distribution of luxury kitchen appliances since 1965," came up with an oven running Android ICS, of all things, and the design and interface there has been developed in collaboration with BMW Group DesignworksUSA, which are consulting many design projects, not only the renowned car maker. Packing a 7" display, and powered by a 1GHz Exynos processor joined by half a gig of RAM, 16 GB of storage and microSD slot, the Android component uses 4.0.3, and it can run apps from the Play Store, but the real innovation is the interface and integrated cooking apps. There is a built-in controller to access the Dacor Discovery IQ Cooking Application and Guide, and the oven can be reached remotely via your Android phone or tablet as well. The guide preprograms the steps you need to take for thousands of popular recipes, and leads you during the preparation. When the dish is ready, the oven will alert you on your phone with a push notification or text, and you can, say, tell Dacor's gadget to warm it up before you get home. Self-diagnostics messages and troubleshooting can also be sent over to your phone or tablet, and the oven works in the background with Dacor's servers to receive automatic firmware updates and the like. Industry leader of innovative design and concepts for the kitchen will showcase the world’s first built-in Android TM oven at premier media event. Las Vegas and at Showstoppers, the global leader in technology showcases, during International CES 2013, held on Tuesday, Jan. 8 from 6-10pm at the Wynn Hotel, Lafite Ballroom, in Las Vegas. Dacor is responsible for many industry firsts including the 30” Self-Cleaning Pure Convection™ Wall Oven, which set the standard for this built-in appliance category. The Discovery™ 30” Wall Oven represents Dacor’s 9th generation of 30” built-in wall ovens. The company’s dedication to continuously manufacturing innovative luxury appliances is evident here. Specifically, the Discovery Wall Oven connects the kitchen to the home via a new industry exclusive – the Discovery IQ Controller, which is the first Dacor oven to feature Wi-Fi connectivity. With the Discovery IQ Controller, home chefs can expect the latest technological advances for the kitchen running on the Android OS platform. Powered by a Samsung 1GHZ Processor and 512MB DDR2 RAM, the built-in controller is exclusive to Discovery™ Series Wall Ovens. The controller rounds out with complete Wi-Fi connection capability and is equipped with stereo sound and a PowerVR SGX 540 graphics processing unit delivering an exciting multimedia experience through a 7” LCD glass touch screen panel. The graphic user interface (GUI) is easy to use and is the most recent collaboration from Dacor and BMW Group DesignworksUSA, an international leader in design strategy, premium design development, and brand communication. With the built-in Discovery IQ Controller home chefs can access the Dacor Discovery IQ Cooking Application and Guide while simultaneously downloading other popular applications through the Google® Play Store, researching new recipes or viewing cooking video demonstrations wirelessly through a home WiFi network. The Discovery IQ Controller with interactive cooking application and guide can also be accessed remotely by the home chef throughout the home with their own Wi-Fi enabled tablet or smart phone. The IQ eliminates the guesswork associated with preparing popular dishes and family recipes by way of a pre-programmed guide. It enables users to prepare a wide range of dishes to perfection with the touch of a finger. Simply select the desired recipe from the display menu, insert the dish, initiate the program and relax as the oven takes care of the rest. Additionally, when the desired cook time has been reached, the oven will place the dish on warming mode, keeping food warm until ready to serve. With Dacor’s proprietary IQ application, the kitchen takes on a life of its own. Once a dish is ready to serve, the IQ will notify the chef via text message or push notification. Should the wall oven encounter a problem or require maintenance, IQ will notify the owner with an error message and an automated report will be sent to Dacor for troubleshooting. To ensure optimal IQ and oven performance levels, automatic system updates and self-diagnostics will be downloaded directly to the IQ Controller via Wi-Fi from the Dacor server. TM Steam Technology which cleans light build-up in 30 minutes without the use of high heat or harsh chemicals; and GlideRacks™ equipped with a convenient easy-pull handle which allow the home chef to move heavier dishes in and out of the oven easily. And to top it all off, personalize your Discovery Wall Oven by selecting one of two handle options, the professional Epicure® stainless steel handle, or the proprietary Dacor integrated stainless steel handle, for a flush contemporary look. sealed burners. Today, Dacor utilizes the expertise and heritage of a third generation, family-owned company to provide exquisitely designed luxury appliances. Dacor was established with the principles of innovation, style, performance, craftsmanship and sustainability. The company manufactures three luxury product collections; the innovative Discovery™ Series, the intelligent Renaissance® Series and the essential Distinctive™ Series, to fit the needs of the discerning home chef. Samsung's new T9000 refrigerator runs the Evernote app on a 10" LCD display built into the front door, and uses it to "share photos, videos, and even recipes with family and friends," instead of the usual Post-its you slap on your golden oldie cooling box in the kitchen. The T9000 is, of course, loaded with high-tech stuff like Samsung's Triple Cooling System for "commercial grade humidity levels maintained in the fresh food compartments with the help of two compressors, three evaporators and an array of sensors to keep produce fresher longer." Whether you think this is overkill or not, the fridge with the Evernote app will dawn on you faster than you can say "I'm out of ice," and it even has baby monitoring capabilities, we kid you not, as well as the usual assortment of calendar and weather apps. From here it is just a stone throw away to a full-blown Android refridgerator next year. LAS VEGAS – January 7, 2013 – Samsung Electronics Co., Ltd. announced today its expanded line-up of premium home appliances for the kitchen at the 2013 International Consumer Electronics Show (CES) from January 8-11, 2013. Samsung, the company that revolutionized the home appliance category with the four-door refrigerator and a freestanding range with the FlexDuo oven, is once again redefining the appliance experience in the kitchen with new refrigerator and range form factors that bring unmatched ease of use, convenience, organization and style to the kitchen. "As America's fastest growing appliance brand, Samsung's award-winning products deliver the flexibility that busy families not only need in the kitchen, but also want," said Kevin Dexter, senior vice president of home appliances sales and marketing, Samsung Electronics America. "From our latest four-door refrigerator with unsurpassed fresh food storage, to appliances that open a host of new cooking possibilities, this year's kitchen line from Samsung will make entertaining at home easier and more fun." The 32 cu. ft. capacity Samsung T9000 Four-Door Refrigerator represents the next evolution in refrigerator design, with a new form factor that delivers the most fresh food storage in its class. This sleek refrigerator features a 19.4 cu. ft. capacity French Door refrigerator compartment on top, and a 6.1 cu. ft. compartment on the lower right side, providing an extraordinary 25.5 cu. ft. of fresh food storage. The lower right compartment can also be used as a freezer if desired, and is complemented by a 6.1 cu. ft. freezer on the left side in this unique and versatile design. Imagine the possibilities of using the lower right side compartment as a kid zone, as a prep zone for a special meal, as a centralized storage area for a family member with dietary restrictions, or to replace a separate beverage refrigerator. In addition to being flexible and stunningly beautiful, this refrigerator also performs. To help ensure optimal temperature and humidity control, as well as performance in each of the fresh food zones, the T9000 has Samsung's Triple Cooling system. This unique cooling technology ensures that commercial grade humidity levels are maintained in the fresh food compartments with the help of two compressors, three evaporators and an array of sensors to keep produce fresher longer. 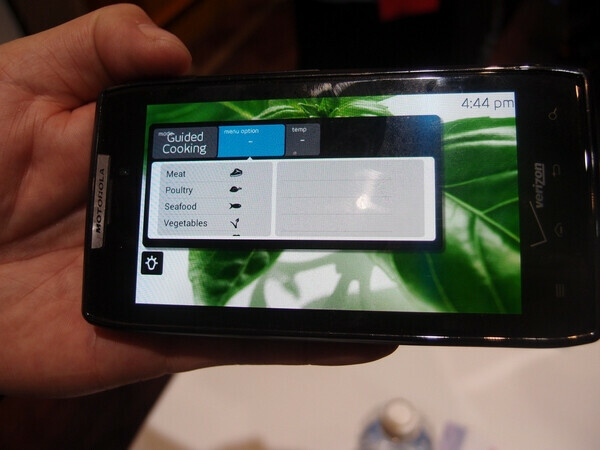 Finally, only at CES in the Samsung booth, the T9000 LCD is on display, featuring apps to help families stay organized and connected in the kitchen. In particular, the T9000 LCD includes the Evernote app, which allows consumers to share photos, videos, and even recipes with family and friends. The T9000 LCD also includes calendar and weather apps, and more. The Samsung T9000 Four-Door Refrigerator (Model: RF32FSQDBSR) will be available in late Spring 2013 for an MSRP of $3,999. For premium kitchens and high-end renovations, the beautiful and sleek Samsung NE58F9710SR is the first-ever 30" slide-in range with an oven cavity that can be split into two separate compartments, making the cooking experience easier, more efficient and more convenient than ever before. Technologically According to Traqline 2012inspired by Samsung's highly successful FlexDuo Oven, the NE58F9710SR offers new kinds of flexible cooking options that enable families to use the full large 5.8 cu. ft. capacity oven cavity for larger dishes like holiday turkeys, or they can use the Smart Divider to divide the oven into 2.4 cu. ft. and 3.3 cu. ft. top and bottom compartments for smaller items like dinner and dessert. This allows consumers to cook multiple dishes at two different temperatures at the same time with no noticeable aroma transfer. 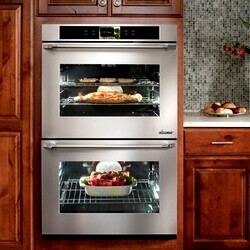 The NE58F9710SR Slide-in Range with FlexDuo Oven will be available in June 2013 for an MSRP of $2,399. Flexible cooking options don't stop there. The Samsung NE597N0PBSR Induction Range – a 2013 CES Innovations Award Honoree – is the first-ever 30" freestanding electric range to feature the FlexCook Zone™ and Samsung Boil Alert™, as well as SteamQuick technology. The FlexCook Zone acts as a fulllength bridge element, letting consumers cook large pots and pans across one large induction element without having to worry about incomplete heat distribution. When the bridge element is not in use, it can be used as two separate 9-inch elements. The NE597N0PBSR Induction Range also features intuitive Samsung Boil Alert™ technology, which senses small vibrations as water begins to heat up. When the vibrations reach a certain level, it provides less heat and also notifies consumers with a series of beeps. In the oven cavity, the NE597N0PBSR has a Triple True Convection system that combines a convection oven with a multi-fan system to circulate heat evenly throughout the chamber, resulting in faster and more energy-efficient cooking. Finally, traditional oven cleaning typically requires long periods of high heat, then manually wiping out the charred residue. Samsung's SteamQuick technology requires less time, power and effort. All that is required is one cup of water to clean in just 20 minutes. The Samsung NE597N0PBSR range will be available in June 2013 for an MSRP of $1,999. Also a 2013 CES Innovations Award Honoree, the Samsung ME179KFETSR OTR Speed Oven provides everything that busy families need to prepare a home-cooked meal. It is a convection oven for even cooking, a toaster, a broiler, a microwave, and range hood all in one powerful appliance. The Samsung ME179KFETSR even makes maintenance easy with the first-of-its-kind Simple Clean Filter, which revolutionizes how consumers change their OTR filter – a task that few realize is necessary to reaching optimal performance from the appliance. The ME179KFETSR also features smart yet practical details like best-in-class LED lighting that rarely requires replacement yet offers superior cooktop illumination and Ceramic Enamel interior for easy cleaning. The ME179KFETSR OTR is available now for an MSRP of $649. Ford released the Ford OpenXC SDK for Android developers at CES 2013, designed to allow anyone with an Android device access to their Ford car’s sensor data. Needless to say, this can serve many purposes, and is open source, but it's only data that is accessible, not the embedded software that runs the vehicle, so as nobody would hack into the process. Developers can play with things like average gas mileage, GPS coordinates trail or vehicle speed data in many forms to create innovative apps that will let you follow your driver's habits and experience with your specific vehicle through your phone. Another possible application is that this kind of data is collected with an app, and sent anonymously to Ford's central servers for averages, comparisons and troubleshooting, so that Ford can improve on the car building process, or address any problems that arise with a certain percentage threshold of drivers quicker than ever. You will also be able to compare your averages with other drivers that sport similar usage pattern, and get alerts if things are out of whack with your vehicle, signalling potential trouble ahead, for instance. These are just three examples of what's out there, and don't even get us started on the new home automation solutions controlled via your Android smartphone or tablet, which are worthy of a separate piece. What do you think, do you approve of where things are heading with the increasing interconnectedness of our phones, cars and household appliances - are you excited, or do you think this is overkill and too much information to share with someone's servers? THIS is what you call innovation. True innovation. --Fridge looks impressive!